Next week brings us Passover and Easter. And just these two holidays alone can spell diet disaster. If you’ve ever eaten matzoh, you know that it stays in your system for all eight days, unable to find a way out! And matzoh balls can sometimes weigh as much as a Mack truck. An Easter brunch menu offers similar regimen wreckers as Thanksgiving fare, plus the obligatory chocolate eggs. And we haven’t even gotten to the rest of the barbecues and feasts found on Mother’s Day, Father’s Day, Memorial weekend, July 4, and at June weddings, to name just a few. So what are we to do if our intent is to still be able to fit into a bathing suit this summer? Since there doesn’t seem to be any end to opportunities to pile on the pounds, I asked Jacqueline B. Marcus, a Nutrition Consultant and Owner of Jacqueline B. Marcus and Associates Food and Nutrition Consulting in Highland Park, Illinois, if it’s possible to be Better Than Before weight-wise in spite of it all. Happily, Jacqueline devotes an entire chapter to healthy weight management in her new book, Culinary Nutrition: The Science and Practice of Healthy Cooking. “Yes,” she began, “you can end the nonsense and regain control, if you simply stop, look and listen.” By that she means to stop the negative self-talk about your body and willpower, to take a hard look at yourself in the mirror and the numbers on your scale, and then to listen carefully to her advice to achieve and maintain your “true weight,” no matter what the temptations. If you are invited to dinner, first up is to call ahead and ask your host: “What’s cooking?” If the answer is a collection of calorically-challenged courses, propose to augment the repast with BYO. Offer to bring a favorite dish to share the cost of a holiday meal. (You don’t have to mention that it is –horrors!—healthy.) If you happen to have a green thumb in cooking rather than gardening, there is no rule against buying something rather than risk poisoning your friends. 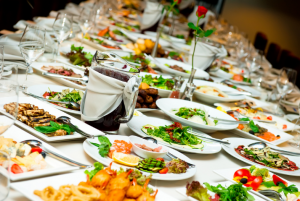 Of course, not all (or that many) social occasions will lend themselves to a non-insulting offer to bring your own food to someone else’s dinner party – or even an inoffensive query as to the menu. So Jacqueline suggests that if friendship or propriety trumps your diet concerns, eat a little lean protein or veggies beforehand to lessen your hunger. The post Better Than Before: Thinner for (Holiday) Dinner appeared first on Intent Blog.